Melbourne property developer and industry lobbyist Marco Gattino has won approval for an office tower on Chapel Street in South Yarra, adding more weight to the suburban office boom, reports the AFR. The development approval marks Goldfields’ first foray into the commercial office sector from residential projects. 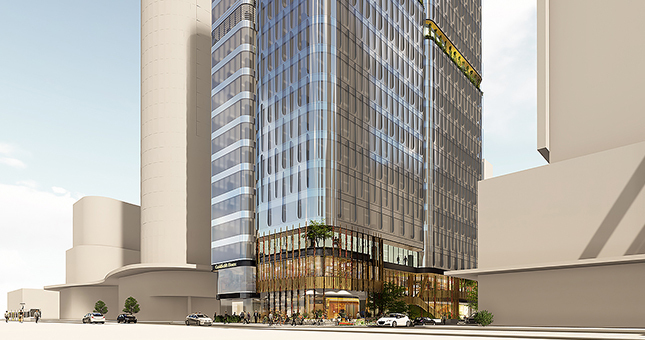 Goldfields sought a permit in June for a 24-level office tower with 24,000 square metres of office space and ground floor retail at 627 Chapel Street. This was granted, following revisions, by the City of Stonnington just before Christmas. “627 Chapel Street sets the scene for future-focused business and will attract progressive occupiers with progressive needs,” Mr Gattino said of the COX-designed glass tower. “When we acquired the site, the environment was already positive for commercial. A-grade suburban rents have gone up 10 per cent. They’re approaching $600 a square metre and that was unheard of a few years ago,” he told The Age newspaper. With limited development supply in the short to medium term, Melbourne’s CBD vacancy rates has shrunk to as little as 3 per cent – pushing tenants into fringe office markets. Mr Gattino acquired the site from another prominent Melbourne developer, Paul Fridman’s Fridcorp, for $50 million in December 2017, after Fridcorp failed to secure a permit for a 37-level residential tower on the site. Construction of the office tower, which has a $90 million construction budget and projected end value of $300 million, is set to kick off in mid-2019 and will take about two years to complete. Gurner will retain ownership of the building in Fitzroy North, as the developer looks to diversify its portfolio by holding on to long-term assets that generate annual returns. The mid-rise building comprises half and full-floor tenancies ranging between 1,000sq m and 2,000sqm, 110 serviced apartments and a 1,687sq m supermarket. Gurner is developing the land parcel with a partner who acquired the site in 2015 for $15.5 million. The rich lister says the project will complement his “robust” residential development arm. “We see this as an opportunity to expand our portfolio with assets that allow us to retain ownership and complement our residential arm with another asset class that delivers long term financial returns,” Gurner said.